I like to guarantee my work. There's a lot of scam artists out there, so I don't want you to be concerned about that. 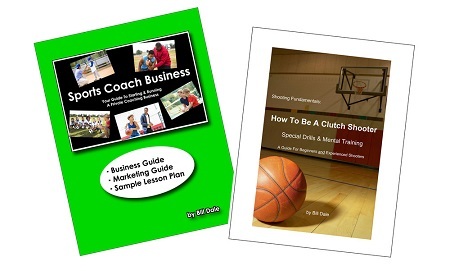 Take 3 months to look over my manual and put it to use in building your basketball lessons business. If after that time, you don't think that your investment was worth it, just return the book and I'll refund every cent of your money. I don't think anyone else will offer to give you a 100% refund like this. If you are a serious life-long basketball student like me, then you've probably bought several other books and videos for basketball drills and coaching. But have you ever been able to send these things back if you weren't happy with them? Usually, once you open a video or DVD, you can't return it, unless there's something wrong with the tape or disc itself. But if you think there's something wrong with the content, it doesn't matter - you're stuck with it. At best, some companies only give you 30 days to try out their DVD's, videos, and books. I don't want that to be a reason why you don't give this a try. That's why I'll give you 3 months.